When a sedan just isn't enough, both Subaru and Toyota offer hatchback models of their famous Impreza and most recently, the Corolla. How does this new hatchback compared to the Impreza, though? 2019 brings ample opportunity for both of these vehicles to improve, and we're here to report on the advantages of how these vehicles stack up against each other! The Impreza Hatchback is powered by a 2.0-liter DOHC direct injection four-cylinder engine. In the Subaru style, this powertrain is a Boxer engine, named for its horizontally-opposed cylinder orientation, which improves on stability and reduces engine noise. This powertrain generates 152 horsepower and 145 lb-ft torque. A five-speed manual transmission is standard within the base model, but there's an available continuously variable transmission that's standard on higher trims. 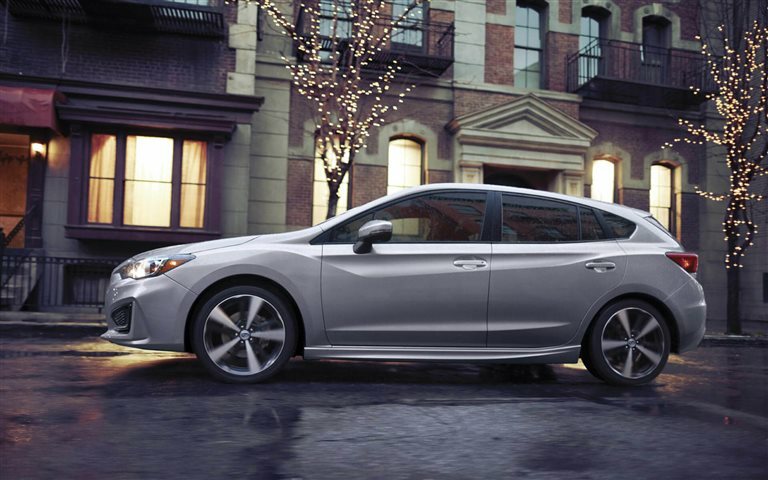 With this automatic transmission, the Impreza Hatchback supplies 28/36mpg. A bonus standard: symmetrical all-wheel drive! The Impreza is built to last, with 96% of models sold in the last ten years still on the road today, making it one of the most durable hatchbacks around. The Toyota Corolla Hatchback is similarly equipped with a 2.0-liter DOHC direct injection four-cylinder engine, paired standard with a six-speed manual transmission. There's a continuously variable transmission for the Toyota, too, but it's only available on its standardly equipped higher trim models. This powertrain generates 168 horsepower and 155 lb-ft of torque, coming with an EPA rated 27/37 mpg. While the power may be more impressive in numbers, the Corolla Hatchback is going to struggle more in harsher weather due to only coming in front-wheel drive. The Impreza's clear advantage is plenty of room for passengers and cargo alike! 100.9 cu.ft of passenger space lends to better overall headroom, legroom, and shoulder room for both front- and second-row. Greatest of all, the trunk space is enormous even with the rear seats. 20.8 cu.ft come standard, and that's expandable to over 50 cu.ft of cargo capacity with the 60/40 second-row folded flat. Its wide rear gate makes for easy loading and unloading as well. For anything that can't fit, roof racks are graciously supplied standard. Convenience and comfort is supplied in more than simply spaciousness, though. The Impreza Hatchback is equipped with six-way adjustable cloth-upholstered seats standard with leather-trim available in higher models. The standard entertainment system is provided via a 6.5-inch multimedia screen, coming with Bluetooth, USB and AUX inputs, Android Auto, Apple CarPlay, and smartphone app integration for features such as Pandora and Aha. Audio, phone, and standard cruise control buttons also come upon the steering wheel for worry free hands-free operation. The smaller Corolla Hatchback pales in comparison to the spaciousness of the Impreza. Overall passenger room is cut by three- to six-inches all around, providing just 84.6 cu.ft of cabin room. The trunk space is only 17.8 cu.ft, expandable to just 23.3 cu.ft with the rear seats lowered. Designed more for sportiness, the Toyota also lacks a roof rack. The Corolla Hatchback is, however, also equipped with six-way adjustable fabric upholstered driver's seat, with leather trim only available on the highest model. It comes standard with an eight-inch touchscreen that provides Bluetooth, USB and AUX inputs, Apple CarPlay, and Android Auto. The steering wheel also comes equipped with hands free button controls for phone, audio, and standard cruise control. Hatchbacks are made for providing a useable and handy expansion of functional cargo space, and the 2019 Impreza Hatchback is exemplary of this principle. Added power is fine, but it's something you can easily find in a standard sport-tuned sedan. Comparable in features and fuel efficiency, the Impreza Hatchback is an affordable solution for meeting the needs of comfort, cargo, and capabilities. Want to learn more? You can visit some of our Subaru reviews below for specific vehicle profiles and further information on power, provided features, and safety.